Have you noticed that not only do you have fine lines and crow's feet but your skin is looking thinner and crepey? I know I have. I wanted to do something about it, as you know if you'v read some of my other posts I am waging war on aging, and trying out different tools to arm myself with for the fight. I have tried many of the products from Valentia and have never been disappointed. 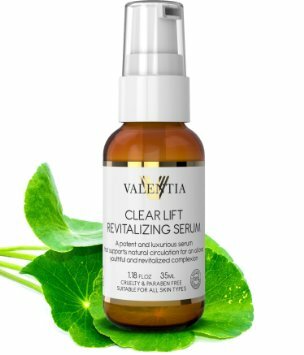 I have just tried a new one Valentia Clear Lift Revitalizing Serum. This is a great blend of lactic acid, plumps fine lines, increases skin's natural thickness, for a healthy youthful look. Gotu Kola and licorice work together to lessen acne scarring, lighten unwanted pigmentation, and even any discolorations. Wakame Bioferment, a powerful seaweed that detoxifies your skin and boost antioxidant defense by increasing skin's oxygen comsumption for a younger fresh healthier look. Before bed in the evening apply 1 to 2 pumps evenly to freshly cleansed skin on face and neck. After it's absorbed follow up with moisturizer and eye products of your choice.